It has happened twice that I have been in Jerusalem during Pentecost. I wrote a little note here about the experience of being in Jerusalem as a non-Jew during Pentecost. It was similar to one I had written several years earlier here. A couple of Israeli readers took exception to some of the things I wrote and made their views known in the comments. I am compelled to make a response to some of the questions and issues raised. You will need to read the comments in order to understand my response. Modern Interpretation of Pentecost. I have been in Jerusalem twice on Pentecost and I have never seen anyone doing what Leviticus 23:15-22 describes. 16 You shall count fifty days to the day after the seventh Sabbath. Then you shall present a grain offering of new grain to the LORD. 18 And you shall present with the bread seven lambs a year old without blemish, and one bull from the herd and two rams. They shall be a burnt offering to the LORD, with their grain offering and their drink offerings, a food offering with a pleasing aroma to the LORD. 19 And you shall offer one male goat for a sin offering, and two male lambs a year old as a sacrifice of peace offerings. 20 And the priest shall wave them with the bread of the firstfruits as a wave offering before the LORD, with the two lambs. They shall be holy to the LORD for the priest. 21 And you shall make a proclamation on the same day. You shall hold a holy convocation. You shall not do any ordinary work. It is a statute forever in all your dwelling places throughout your generations. 22 “And when you reap the harvest of your land, you shall not reap your field right up to its edge, nor shall you gather the gleanings after your harvest. You shall leave them for the poor and for the sojourner: I am the LORD your God” (Leviticus 23:15-22 ESV). Does it need to be said that these offerings were to be made at the tabernacle, or later the temple? Anything short of that has to be a new interpretation. Count seven full weeks from the day after the Sabbath [of Passover week]. The seventh Sabbath is the 49th day. The 50th day is the first day of the week, known in the New Testament as the Lord’s Day (Revelation 1:10). Sabbath + Pentecost “amounts to a two-day holiday.” My USA readers probably had no problem with this. When a national holiday comes on Monday, those who do not work on Saturday frequently say they have a three-day holiday. We know that each day is separate and only one is the national holiday. Sorry that I did not make this clearer for other readers. I know that I did not have any hot food at the hotel for two days. “What you call the Lord’s Supper” was taken once a year. I do my best to speak where the Bible speaks (1 Peter 4:11). The terms/phrases used in the New Testament to describe this meal are Lord’s Supper (1 Corinthians 11:20), Lord’s Table (1 Corinthians 10:211), Communion (1 Corinthians 10:16), and Breaking of bread (Acts 20:7; 1 Corinthians 10:16). There is no evidence that the early Christians observed this meal only once a year. The Lord’s Supper was observed on the Lord’s Day. Did ancient Jews only keep the Sabbath once a year? The earliest Christians were Jews. Full agreement. The book of Acts makes this abundantly clear. They were slow to recognize Gentiles as children of God. We see this discussed in some detail in Acts 15, and the books of Galatians, Romans, and Hebrews. Interesting, isn’t it? That these Jews from every nation under heaven (Acts 2:5) should come to Jerusalem following the teaching of Moses, and that about 3,000 of them would begin following the teaching of the Apostles, is one of the most surprising things in Scripture. My statement, “It would be wonderful to see the gospel freely preached again in this city as it was on that first Pentecost after the death and resurrection of Jesus nearly two thousand years ago” has nothing to do with censorship. I understand that the preaching on Pentecost was in fulfillment of Isaiah 2. The early Christians gradually drifted away from the original teaching of the New Testament. As a Christian who seeks to follow the teaching of Christ and His apostles, I can, and do, make this statement in my own hometown. Lack of knowledge and anti-Semitism. It is popular these days to accuse one with whom we disagree of being racist, sexist, homophobic, intolerant, or anti-Semitic. While I grant that I may have a lack of knowledge on this subject, the charge of anti-Semitism is absurd. I have devoted my entire adult life to serving and teaching the message of Jesus Christ. Here are just a few things I believe regarding Him. He is the Divine Word who was made flesh, the son of David, the son of Abraham (John 1:1-14; Matthew 1:1). He said, “Salvation is from the Jews” (John 4:22). This very people “crucified and killed” him by the hands of lawless men (Acts 2:23; 1 Thessalonians 2:14-15). 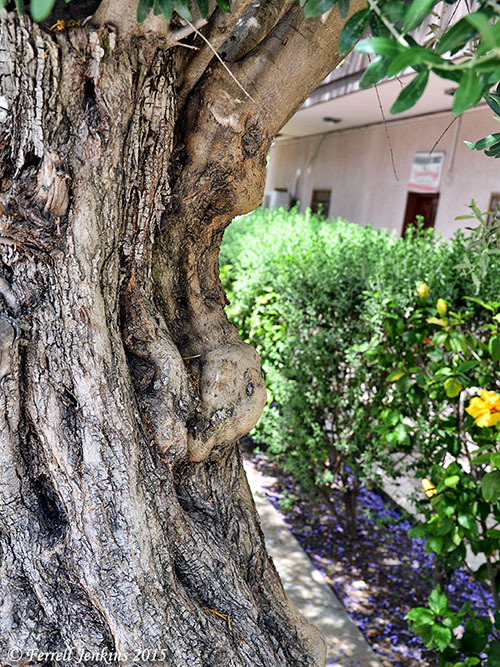 A little church in Nazareth has a beautiful olive tree with a couple of grafts on it in their front yard. I think this may have been intentional on their part to recognize their place in the Lord’s great plan of salvation. An olive tree in Nazareth with a graft. Photo by Ferrell Jenkins. If believing these things makes me anti-Semitic, then I suppose I must acknowledge it, but I think it teaches that some of the Jews accepted Jesus as the Christ (Messiah), and that others did not. Simon Peter’s sermon to Jews on Pentecost, and his sermon at the house of Cornelius, the first Gentile convert, illustrate that the Lord’s requirements for salvation are now the same (Acts 2; Acts 10-11). One final word. This does not mean that the Old Testament (the Hebrew Bible) is cast aside. I understand the Old Testament to be foundational for a proper understanding of the New Testament (Romans 15:4; 1 Corinthians 10:11). These inspired texts say that the Old Testament is for our learning, not for our law. The New Testament is the complete and final revelation of God to man (Ephesians 3:1-5). It may come as a surprise to some non-Christians that the churches with whom I am associated generally have more classes, for both children and adults, in the Old Testament than in the New Testament at any given class period. Other posts about the importance of Pentecost may be found at the following links. Where did Peter preach on Pentecost? We don’t like losing readers, but this work is a labor of love and available free of charge to any who wish to read it. This entry was posted in Bible Places, Bible Study, Book of Acts, Censorship, Church History, Israel, New Testament, Old Testament, Photography, Travel and tagged anti-Semitism, Apostle Paul, Apostle Peter, Jesus Christ, Pentecost. Bookmark the permalink. Wayne, your comment is greatly appreciated. It was my desire to make the points clearly and with graciousness. As Micah wrote: “What does the Lord require of you? . . . To love kindness . . . to walk humbly.” Thanks for a kind, fair, and balanced response, Ferrell. Reblogged this on jennhartwebb's Blog. We must emphatically assert to our Jewish brothers that our Lord and Saviour Jesus Christ and only our Lord and Saviour Jesus Christ is “the Way and the Truth and the Life” and that no one can come to the Father except through our Lord and Saviour Jesus Christ.